Although pigs haven't really been the focus of our livestock fantasies in the past, everything I read about forest farming pushes me toward swine. Unlike goats and sheep, pigs aren't woody plant eaters. In fact, once a tree exceeds two feet in height, they tend to leave it alone. 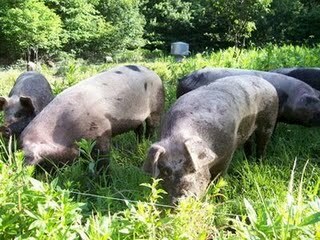 Although they are prone to root up the soil, if pigs are rotated through several small pastures, they do minimal damage. Mulberries were the biggest factor that pointed me toward pigs. In Tree Crops, J. Russell Smith notes that an everbearing mulberry tree can provide all of the food a pig needs for three solid months (from July through September.) I would add in a chestnut tree and a persimmon tree (to bear in the fall) and a honey locust tree (to bear in the early winter), then count on my pigs getting a lot of their nutrition from fresh green undergrowth in spring and early summer. It sounds like I might be able to devise a system where I wouldn't need to feed my pigs supplemental grain except in late winter. Traditionally, farmers around here used to turn their pigs loose in the woods in the fall to fatten on fallen acorns, so oaks would be an obvious addition to the pig forest pasture. However, I don't think we'll include oaks in our plans since they tend to fruit heavily only once every few years, which leaves gaps in our production cycle. Check out our hanging chicken waterer, great in tractors! Don't forget the redbud. It gives a high protein forage. An article I read about forest gardening thirty years ago recommended redbuds. Daddy --- good point with the redbud! They do produce their fruits quite early in the year, which would round out the forage very nicely. Eli --- I probably wasn't very clear. We're thinking about cutting small openings in the canopy to plant individual trees in, the way we have in another forest garden area. So far, it seems to be working pretty well --- since we don't cut more than a tree or two at a time, the forest keeps its forest characteristics, but we're able to give our seedlings enough light that they can grow. I figure we'll have to cut back surrounding trees a few times to give our preferred trees the best opportunity to grow. I have learned a ton and I grew up with pigs, albeit they were penned. I tend to agree with you, by the way. Pigs are fantastic. We have some lightly forested land on which I have thought about pasturing pigs. Our cows enjoy it as summer pasture, but they do not find a ton to eat under the trees. Luckily the meadow sections are excellent. I'll have to poke around on that blog once we get our power back! Were you ever involved in the slaughtering side of pigs? Mark's a bit afraid to get them because he thinks that they'd be too personable and he'd have a hard time killing them. My experience is that the pigs will take down trees quite a bit higher than two feet. Sheep are worse, we have both, but the pigs too will rip saplings apart. They do seem to be fine with the trees that are around 10' tall and about 4" in diameter that have good root systems. Smaller trees often get their bark ripped off. Soft barked trees are particularly in danger. The pigs, and sheep, munch down the regen that grows off of stumps after field clearing. Interestingly, pigs love thistles, brambles and burdock - they're great for clearing these plants. Rotational grazing management is key. Faster rotations make for more grazing behavior and less rooting as well as less tree munching. One of the simple problems with livestock and small trees is trampling. Once the trees get high enough they don't get trampled as much and if the animals are in and out of a paddock that helps too. We also plant various legumes in our pastures to up the protein levels. In the winter sacrificial paddocks we plant things like field pumpkins, turnips, beets and such that are easy to grow for fodder in our climate. This helps with late fall and winter feed. Variety is important as some years one or another crop is a failure due to weather - this years the pumpkins produced almost naught. Have fun with your pigs and other homesteading! Thank you so much for all of that useful information! We're very much in the planning stages, so now's the perfect time to learn about what pigs will do. It sounds like we might be okay with pigs in the woods if we wait until our new trees are relatively big and/or put them into the existing forest with mature trees, as long as we rotate often. Fast rotation seems to be essential in all kinds of alternative pasturing situations --- we're definitely planning on making lots of small pastures. Thanks again for all that info! I'll keep reading your blog for more tidbits. Did you tested, if the pigs really eat gleditsia tricathos -pods? And how much do they like them? The information about pigs and gleditsia in Russels "tree-crops" is not very detailed. And for myself the pods tasted horrible adstringent (but pulp and cooked seeds where palatable for me); -but acorns are very adstringent too, and the pigs like them, so maybe the taste is ok for them (i hope so). That would be a pretty bad kink in our plans! We aren't planning on getting pigs until the pasture is up and running, but maybe we need to find a neighbor's pick and run a taste test. Jake --- We've refrained from diving into large livestock so far, but you might be interested in this post about pigs in a Salatin-style pasturing system.